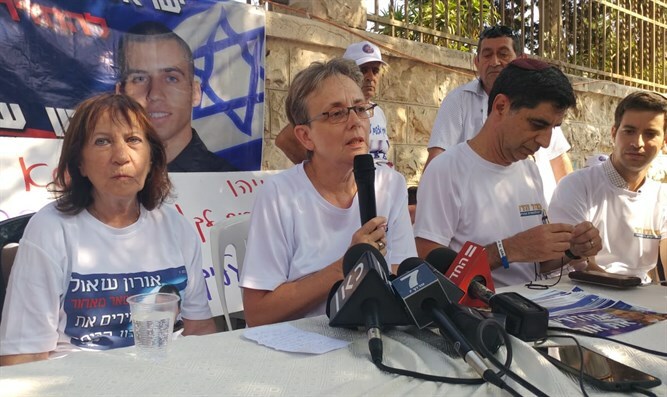 The families of Hadar Goldin and Oron Shaul on Sunday evening set up protest tents outside Israeli Prime Minister Binyamin Netanyahu's home in Jerusalem. Goldin and Shaul were killed during ceasefire initiated by the United Nations (UN) during 2014's Operation Protective Edge. Since then, their bodies have been held by Hamas. The protest tents were set up simultaneous to a Cabinet meeting discussing an Egyptian-brokered peace agreement with Hamas. The proposed agreement would not include a clause ensuring the return of Goldin and Shaul's bodies. Goldin's father, Professor Simcha Goldin, told Arutz Sheva: "The treaty between the families of combat soldiers and the State of Israel has been breached. The Prime Minister sent soldiers into battle and has not returned them for four years." "We are against any agreement regarding Gaza that does not include bringing the soldiers home at the very beginning. That is what the Prime Minister promised us at the outset. Every deal must be conditional upon the return of our soldiers. That is the decision which the Cabinet must make today. Anything else would be the State giving in to Hamas."